This is the first in a series of articles about beauty subscription boxes. 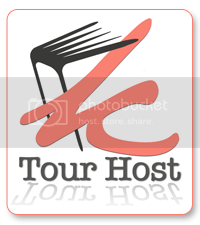 I became aware of these programs just a few months ago and was immediately intrigued. And subscriptions are not a new concept, but have relatively recently upgraded to the 21st Century. Nowadays there are subscription services for almost anything, but it is the beauty boxes that have really taken off. It seems that there are new ones cropping up all the time and I was lucky enough to be able to try out one new such service by the already well established cosmetics company known as Starlooks. 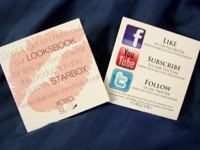 I was so very excited to be able to try out (and review) Starlook’s June Starbox. I received it very quickly and immediately tore into the package. 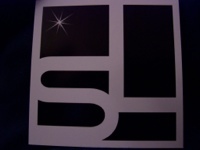 Inside was a small black box with the Starbox logo in gold. The box had a blue ribbon and bow tied on top and really felt like I had received a present. Upon opening I found a notecard that contained a description of each of the items that had been included. I was thrilled to find that June’s theme was all about eyes! Eye makeup is my favorite! I love learning new techniques to highlight my eyes. 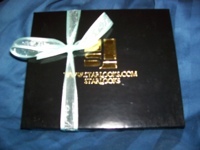 Another thing that sets Starbox apart from other beauty boxes is that they focus exclusively not only on cosmetics, but cosmetics and haircare products from the Starlooks line. Each Starbox includes 3-4 FULL SIZED items each month with a value of at least $35! None of the boxes I’ve seen include all full sized items. in fact most include anything from single serve to deluxe and travel size items. The first item I pulled out of the box was a small precision brush #813 and retails for $15. 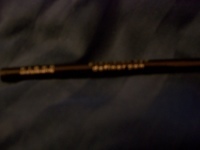 This is a small eyeshadow brush that is great for crease and detail work. I just love the softness and sturdiness of this brush. I have been needing brushes for quite a while as I don’t have many. This brush easily picks up and evenly deposits eyeshadow exactly where I want. I am so impressed with the quality of this brush and that there has been no shedding of bristles either. Just the value of this brush alone is the cost of this entire box! 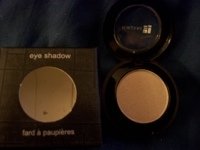 The second item I opened was a beautiful light beige shade of eyeshadow called caricature which retails for $9. I love neutral shades and wear them the most. 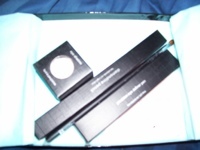 Depending whether the applicator that came with the shadow or the brush I got with this box varies the intensity of the color and the lovely shimmer that this shade has. I didn’t even notice at first that there is a small round mirror and little applicator brush underneath the eyeshadow pan itself! The top of the compact is clear so it is easy to see the shade and with the mirror ‘hidden’ underneath, you get the best of both! And amazingly the little applicator is one of the best I’ve used. It may be small, but it is well made and so very clever! 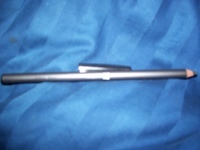 The third black box that I opened contained a precision eye definer pen in black that retails for $13. This small felt tipped eyeliner really packs a punch! It goes on so smoothly and feels very lightweight once on. Other similar eyeliners that I have tried in the past felt very heavy once applied to my eyelids which made them unusable to me. Not this one which has a super lightweight feel yet is still quite noticeable. In the past I’ve typically gravitated to twist up, no sharpening needed, thin eyeliners. but am loving how easy to apply and how dark this pen is. Just one swipe across my lids and I am set for the day and don’t even need touch ups like with the pencils I used to use. And last, but not least I opened a diamonline pencil in myth that retails for $8. 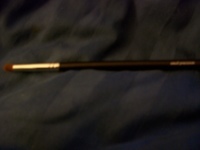 This is a more traditional looking pencil in a dark metallic grey-silver. I figured this pencil would be like so many pencils I’d used before, but when I went to swatch it I was shocked. This incredible pencil was soft and very intensely pigmented. I couldn’t believe just how smoothly this pencil applied. And the shimmer is awesome! And this looked even better on my eyes than the swatch on my hand! I don’t know how Starlooks does it, but this typical looking eyeliner pencil is anything but typical! I am absolutely LOVING each and every item that came in my Starbox! I wasn’t familiar with the products sold by Starlooks, but I am throughly impressed now. The retail value of the items I received is $45 which is well above the $35 minimum value guaranteed in each box. I received all of this as part of the June Starbox. The monthly Starbox subscription plus $1.98 shipping for a total of $16.98. If you love receiving cosmetics 3-4 full size cosmetics in the mail than a subscription to Starbox is for you! 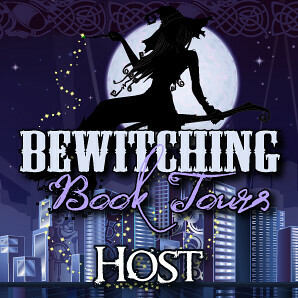 If you do sign up, I would be most appreciative if you would please mention that you were referred by Jaclyn’s Musings! Disclaimer: I received this box complimentary from Starbox for the purpose of this review. All opinions are mine. Please see my disclaimer policy for more information.